It’s climate week. We’re encouraging people to start taking action to prepare for more extreme weather in the future. Whatever your views on climate change there is increasing evidence that extreme weather events are already getting more common in the UK and the trend is likely to continue in a warming world. The year started with all parts seeing exceptionally dry conditions. 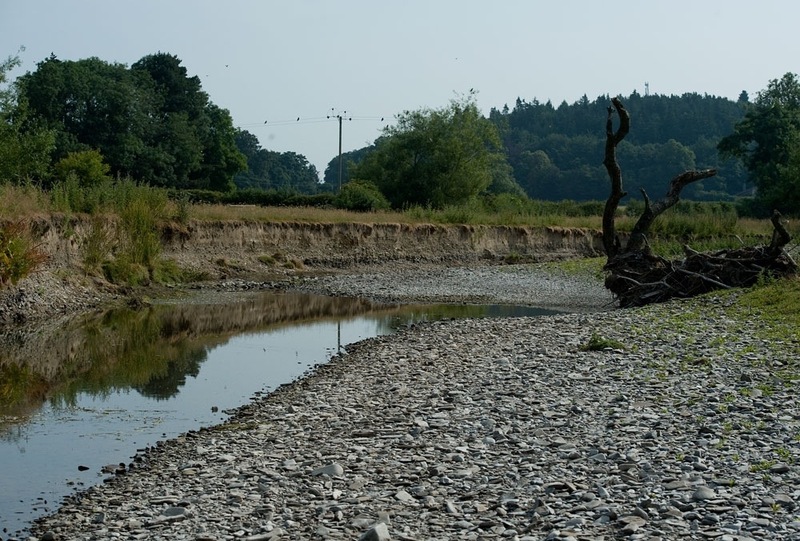 Two successive dry winters and a dry (but dull and cool) summer in 2011 meant that by March the Midlands had recorded the driest 18 months on record. In the chart below red bars represent months that were drier than average. The bigger the bar the drier it was. 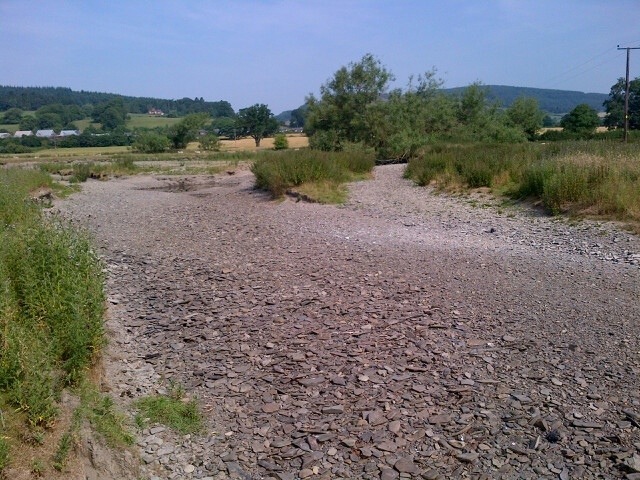 The dry conditions were having a dramatic impact on the amount of water in our rivers. 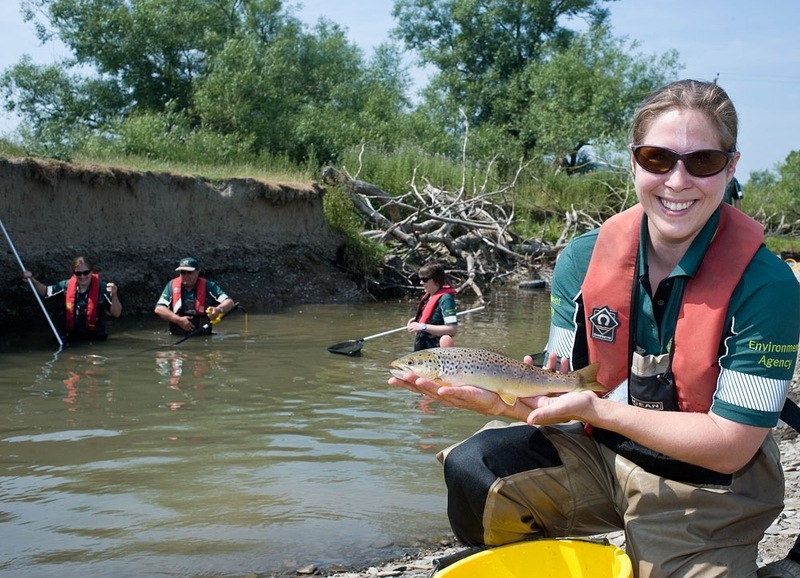 The flows in many such as the Severn, Avon and Wye were less than a quarter of what we would expect. 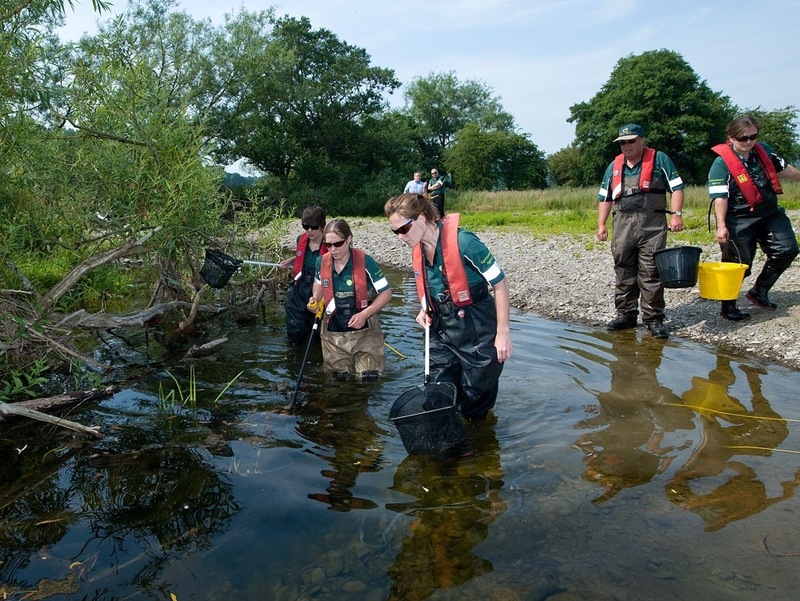 The headwaters of some rivers such as the Teme in Shropshire (pictured below) and Lathkill in Derbyshire actually began to dry out completely and we had to begin rescuing fish that were getting stranded in isolated pools. Farmers and growers were getting increasingly worried about their ability to water crops, particularly if the weather stayed dry through the summer. 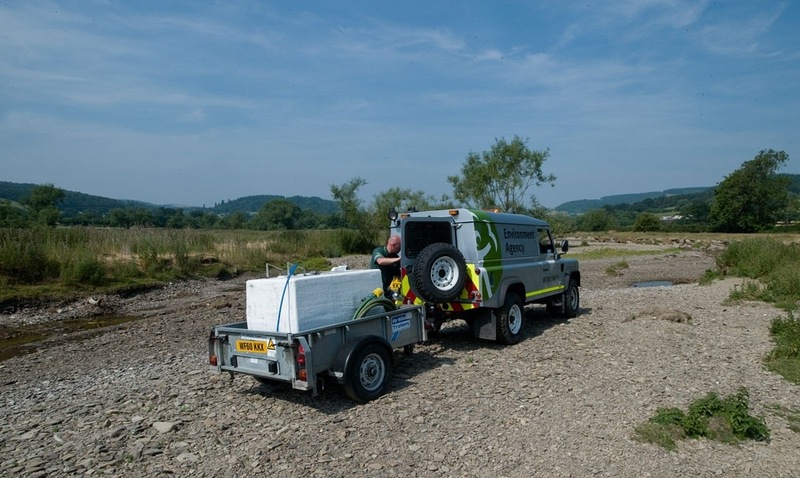 We worked with them, relaxing restrictions on abstraction licences (which farmers need to take water out of rivers) and offering advice on creating new on farm storage reservoirs. We were also getting very concerned about the amount of water stored in the rock beneath us (aquifers). 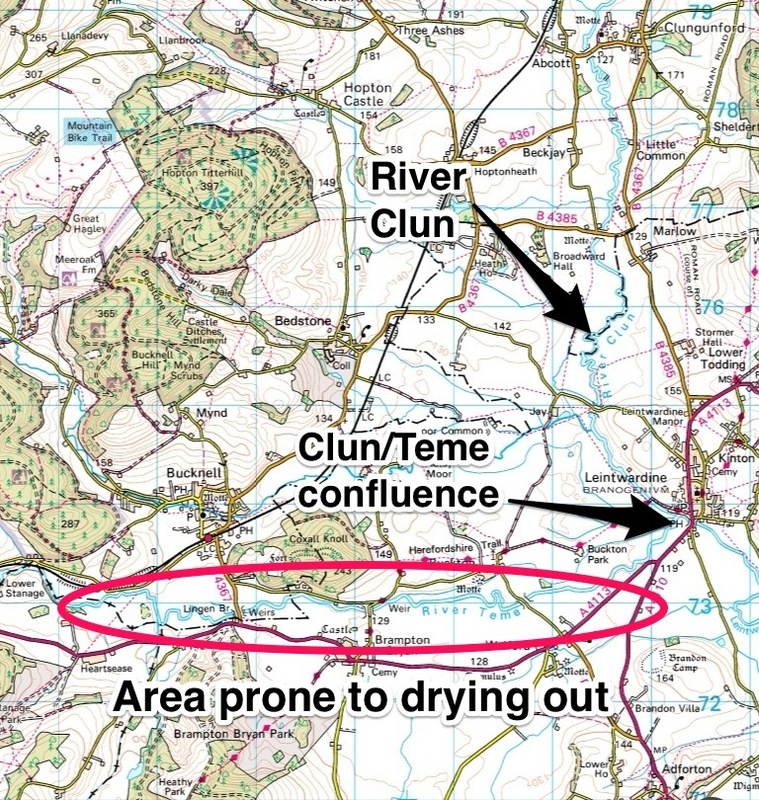 Aquifers are vital both for use by water companies to supply mains water and also to individual homes and businesses that have their own private supply. 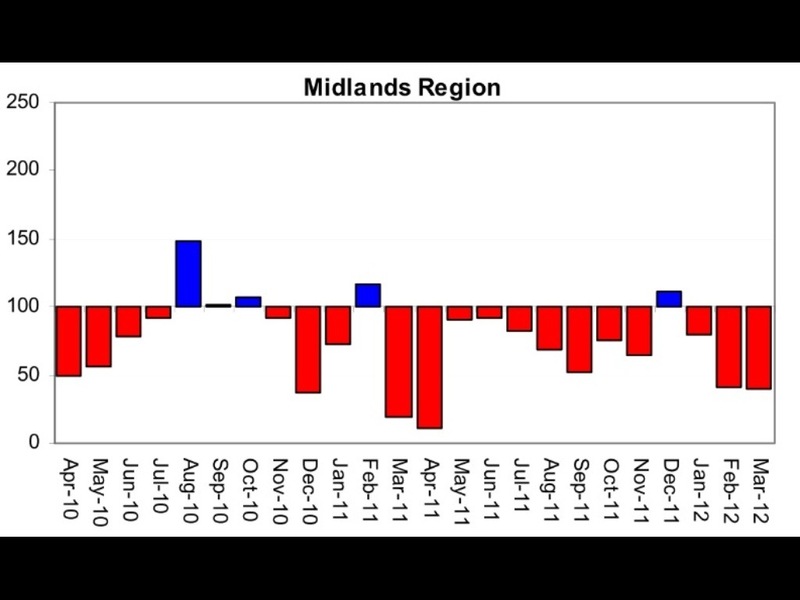 By March levels right across the Midlands were at or lower than those recorded in the drought of 1976. 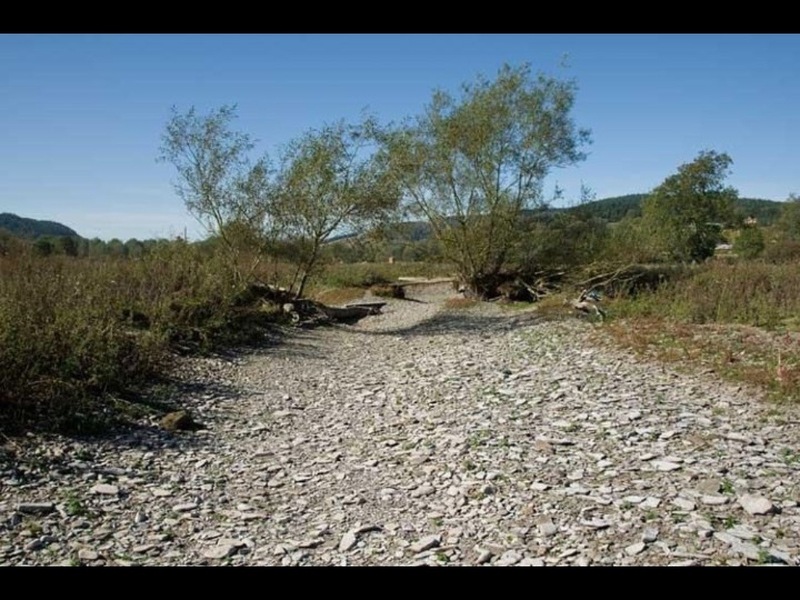 Our models and predictions were telling us that even if we had above average rainfall over the summer of 2012, water resources would continue to be very low through the period. 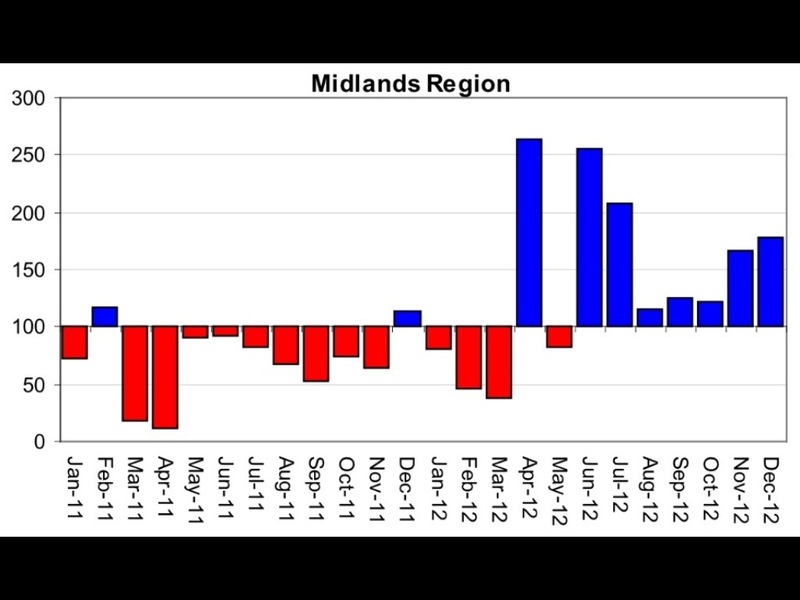 As a result the Midlands formally went into drought on 16th April. Little did we know what lay in store! On Wednesday 4th April it started to rain across the Midlands. Everyone was relieved and grateful for the respite in the drought conditions. The problem was that it didn’t stop! Every month except May until the end of the year was wetter than normal and in many cases much, much wetter. Indeed, by December the preceding nine months were the wettest in the Midlands since records began in 1910 (chart below). 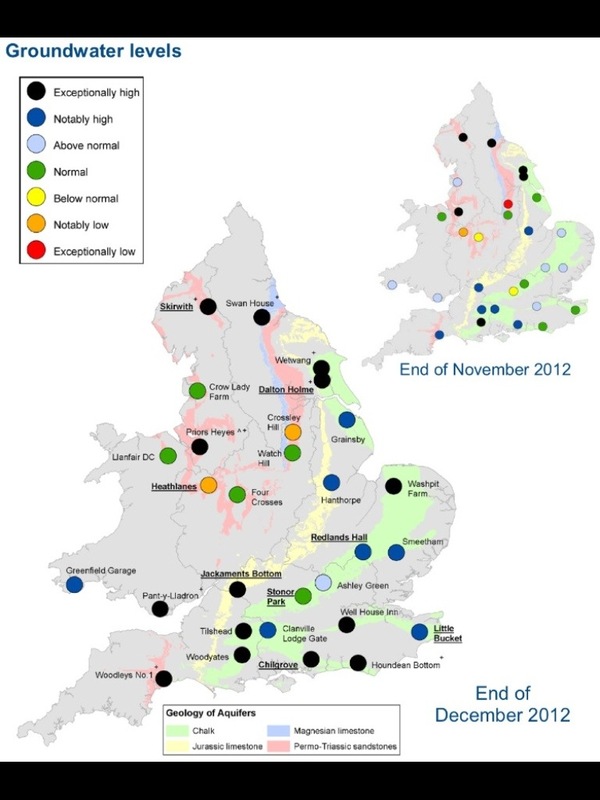 Even more remarkably, when taken as a whole across England and Wales, 2012 was the wettest year on record. This really is amazing when you consider that the first quarter of the year saw virtually no rain! Some of the rain we experienced was very intense, particularly in June and July, resulting in many incidents of flash flooding. 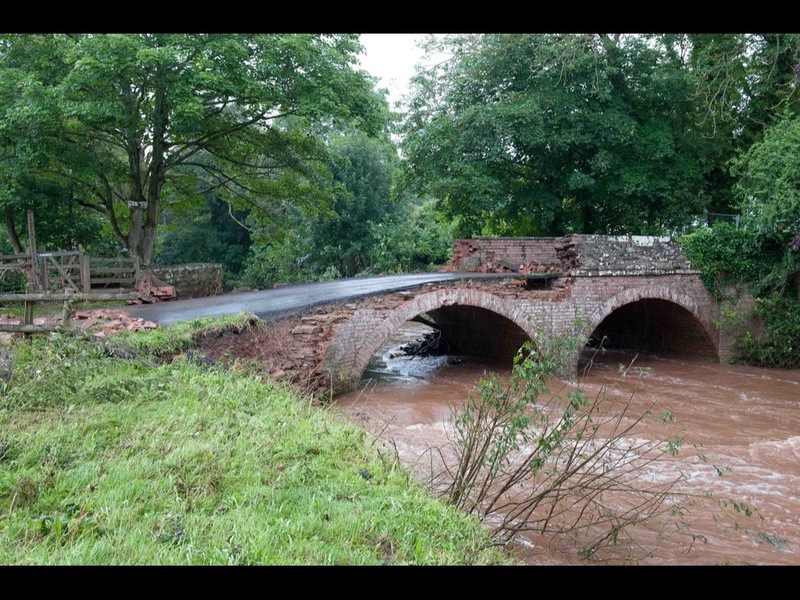 One example of this happened on 14th July when very heavy thunderstorms developed over Shropshire. 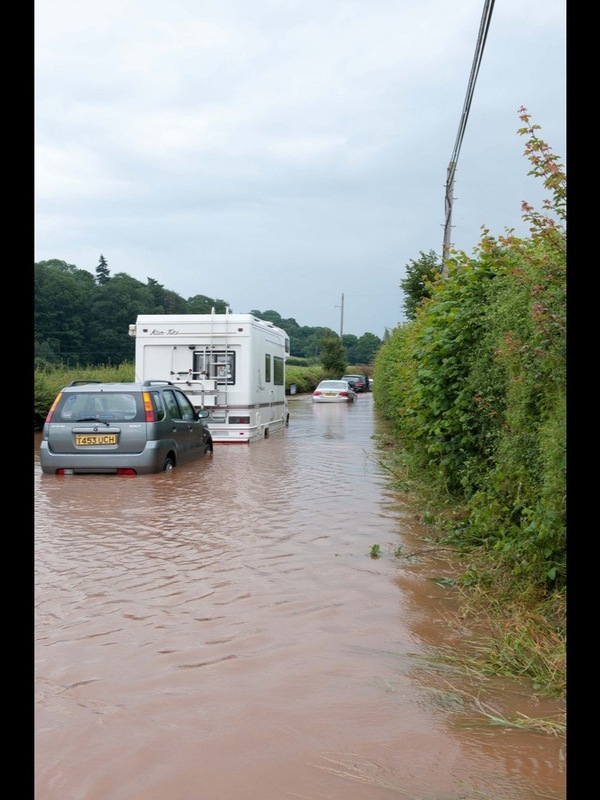 Up to 2 inches of rain fell in a few hours leading to some serious flooding problems around Ludlow and Tenbury (pics below). However, it was the persistence of the rain rather than the intensity that resulted in the long and drawn out flood events that plagued the Midlands over the last nine months. The soil became completely saturated meaning that any rain that did fall found its way very quickly into streams and rivers. There have been seven significant periods of flooding in the Midlands since last April and most of them were caused by relatively small amounts of rain. To make matters worse, several of the wet spells have been close together meaning that river levels have not had chance to recover from the previous flood event. 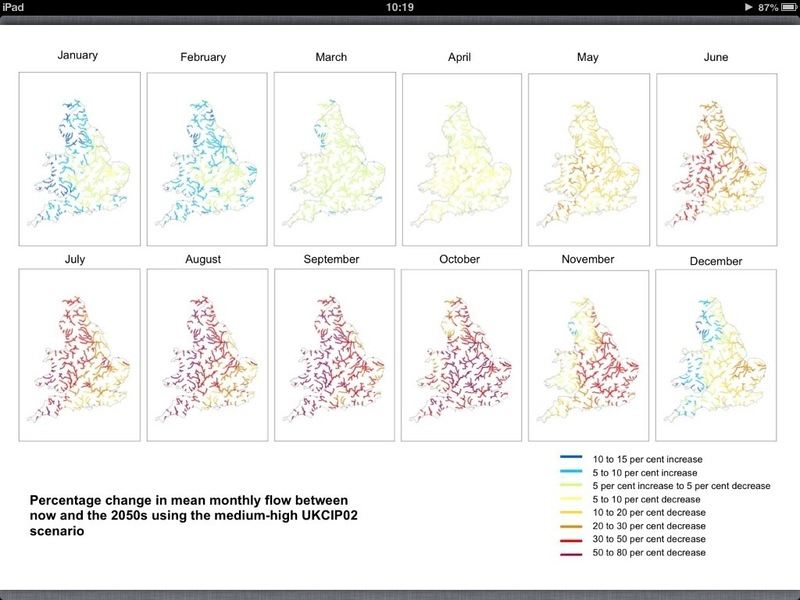 River levels and flows were generally well above average for the whole period from April to December. 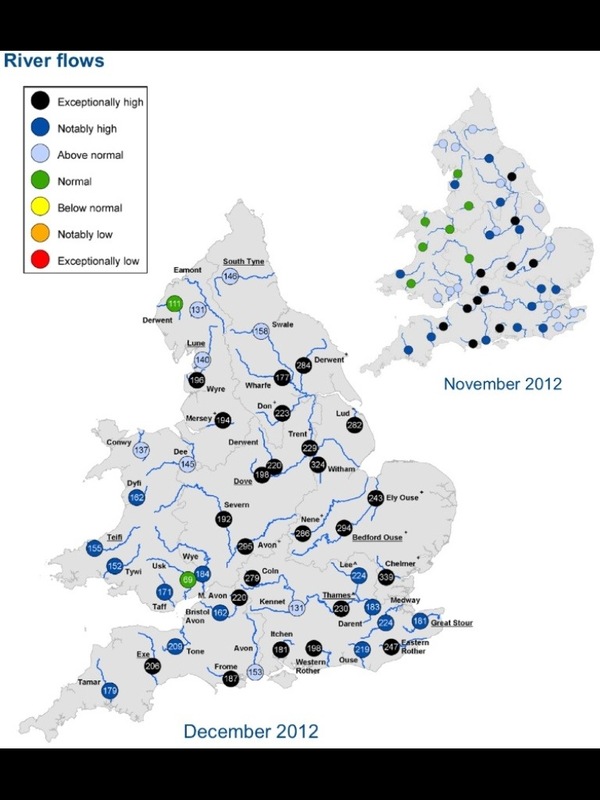 The chart below highlights the exceptionally high flows on many Midlands rivers through November and December. 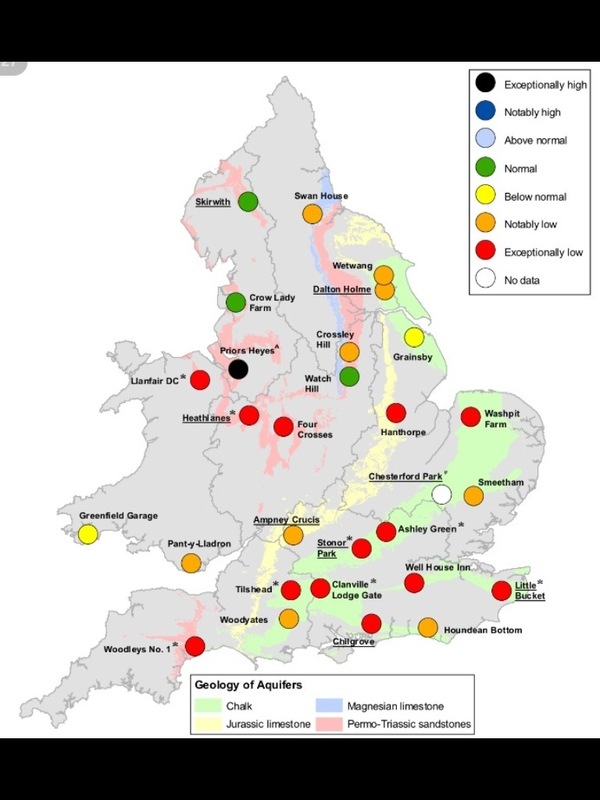 Peak levels observed on the big rivers such as the Severn, Avon and Wye were generally between a one in ten and one in twenty year return period and many towns (Worcester, Tenbury, Gloucester and Evesham) saw the highest levels since the catastrophic flooding of 2007. 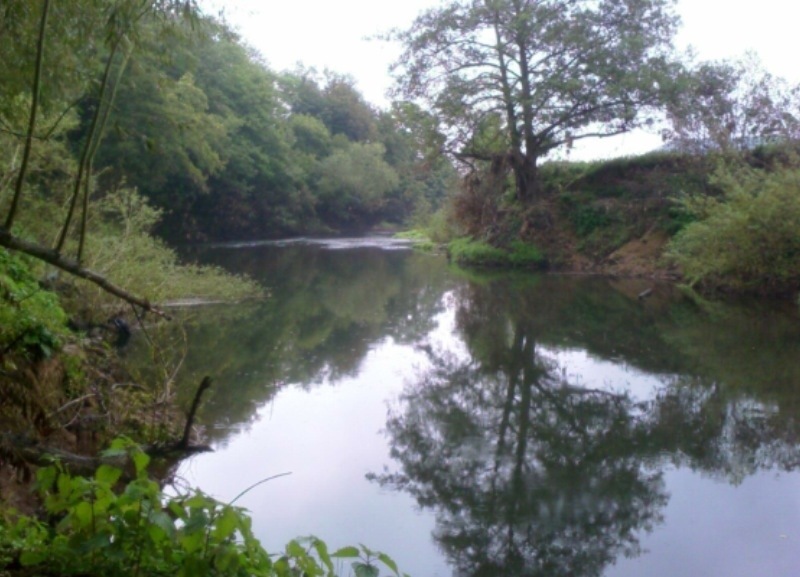 The hydrograph from the River Teme at Stanford Bridge in Worcestershire is typical of many Midlands Rivers. 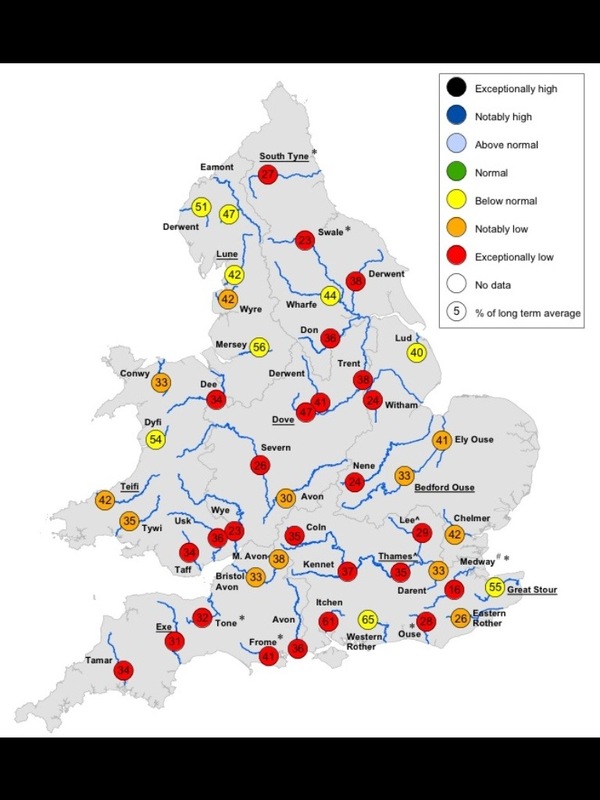 Frequent periods of high levels and showing a rapid response to any heavy rainfall. The flood warning theshold at Stanford Bridge is about 3.8 metres. This was breached nine times during 2012. 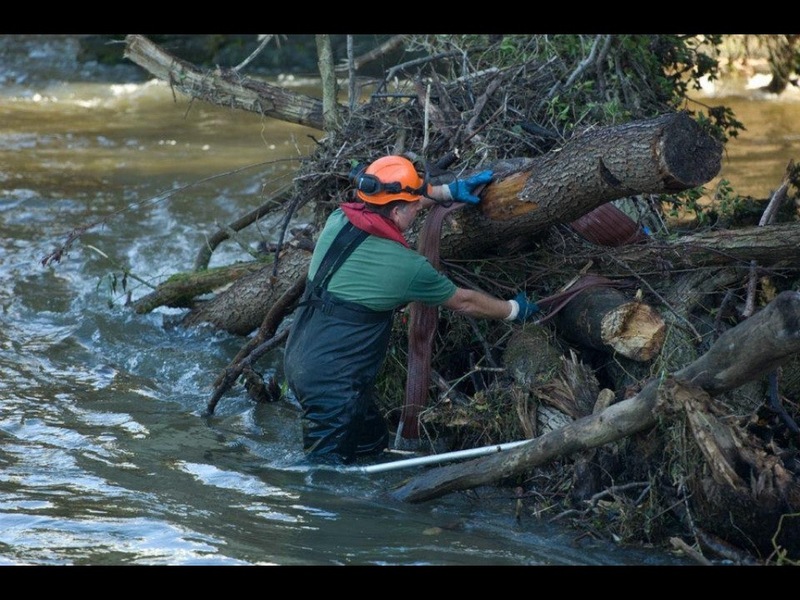 The regular flooding kept us (and our emergency response partners) very busy. 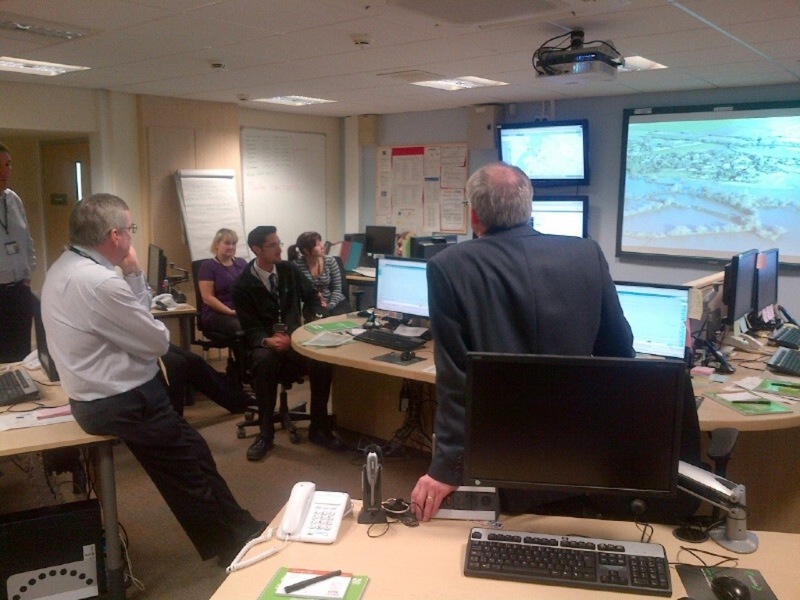 Our incident room in Tewkesbury was open for fifty days between April and December and our flood barriers at Shrewsbury, Ironbridge, Bewdley, Worcester and Hereford were up and down on a very regular basis. 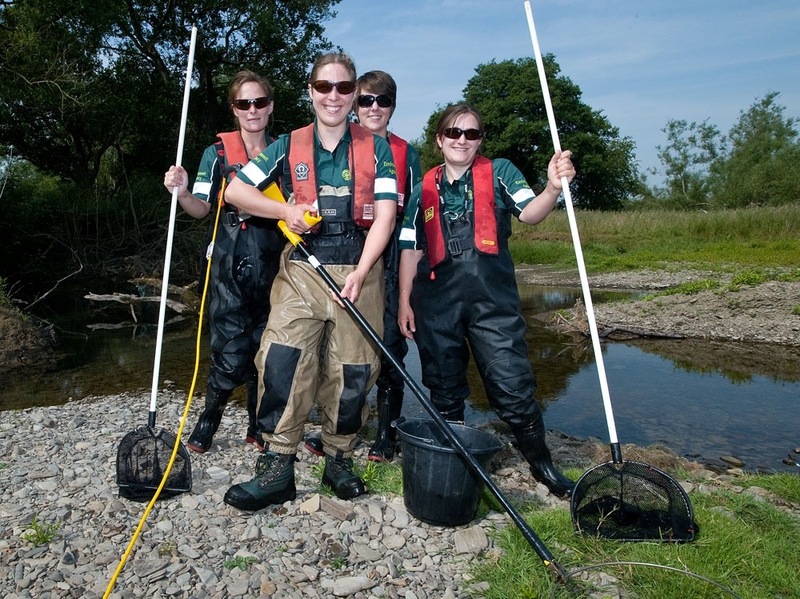 Many of our new defences, built since the 2007 flood received their first real tests. 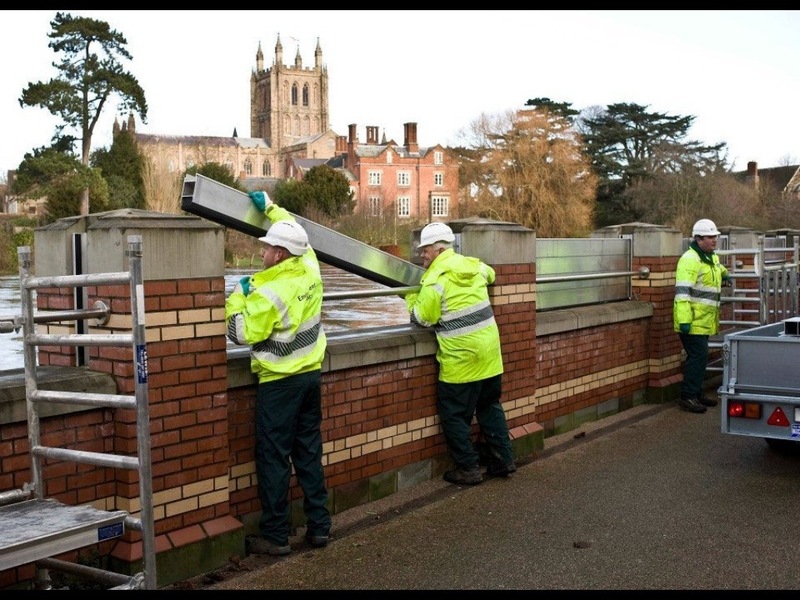 Sadly, despite all our efforts, many homes and businesses did flood during 2012, although many thousands more were protected. 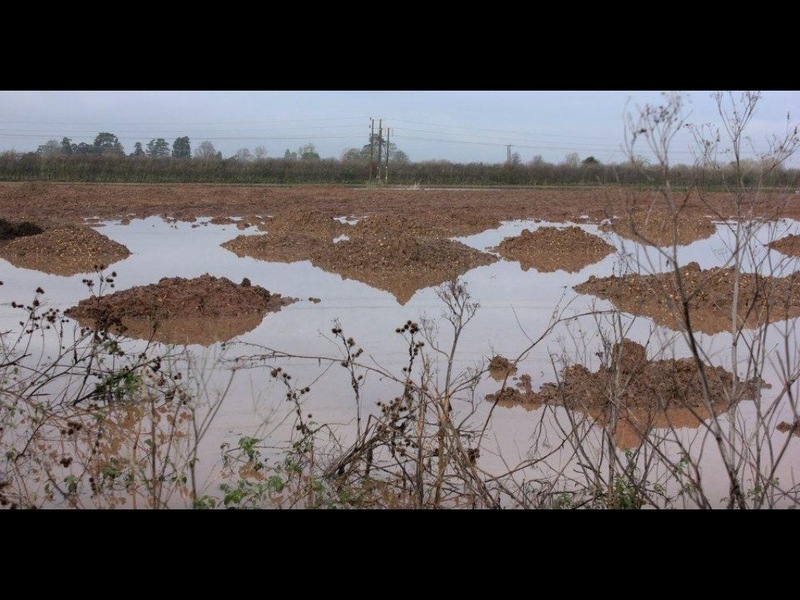 Ironically farmers and growers who in April were worried about whether they would have enough water for their crops found their ground waterlogged and, in many cases, completely inaccessible. Crops have been ruined and feed costs for livestock have escalated as normal grazing has been restricted or prevented. 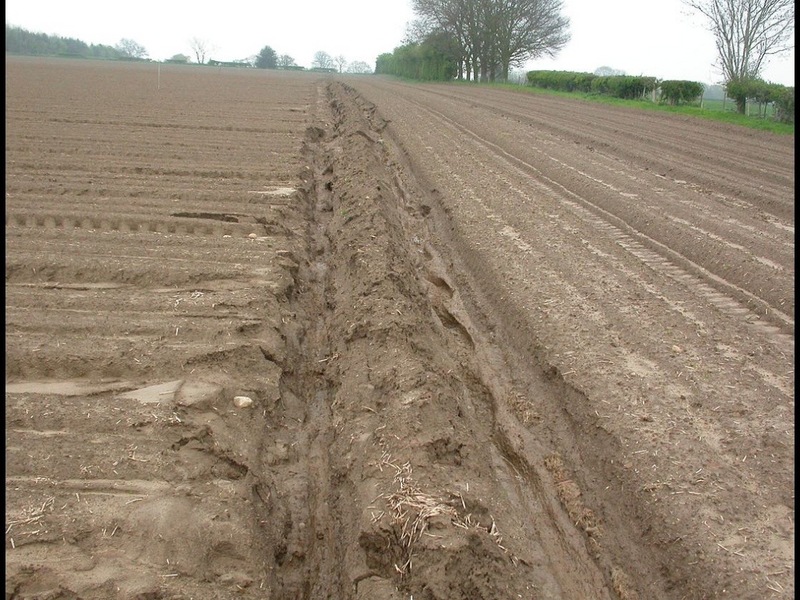 The intense rainfall over the summer also led to many instances of soil erosion. 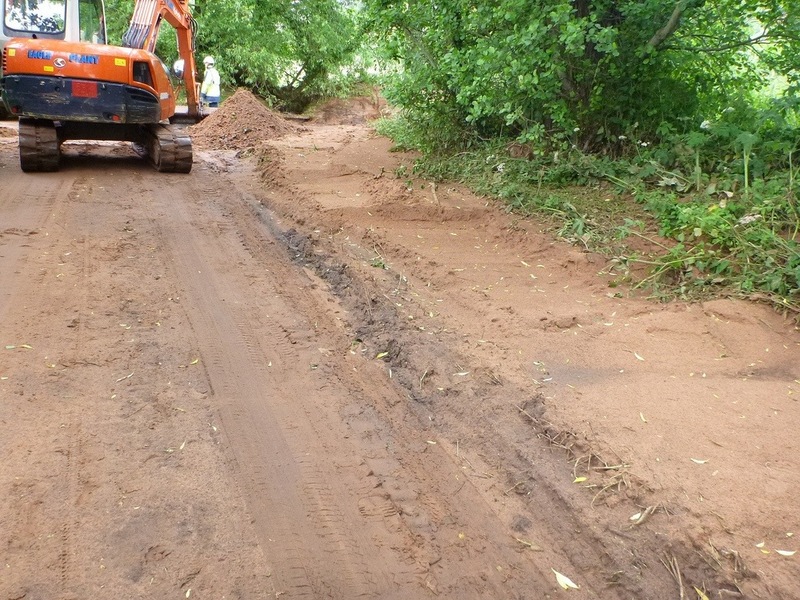 Thousands of tonnes of soil was washed off fields, damaging agricultural land, polluting local streams and in some case blocking roads! Eighteen months of dry weather have now been more than balanced by an exceptional period of wet conditions. When we declared drought in April we said that it would not be resolved by a few weeks of rain (I remember doing the interviews!). We were right! 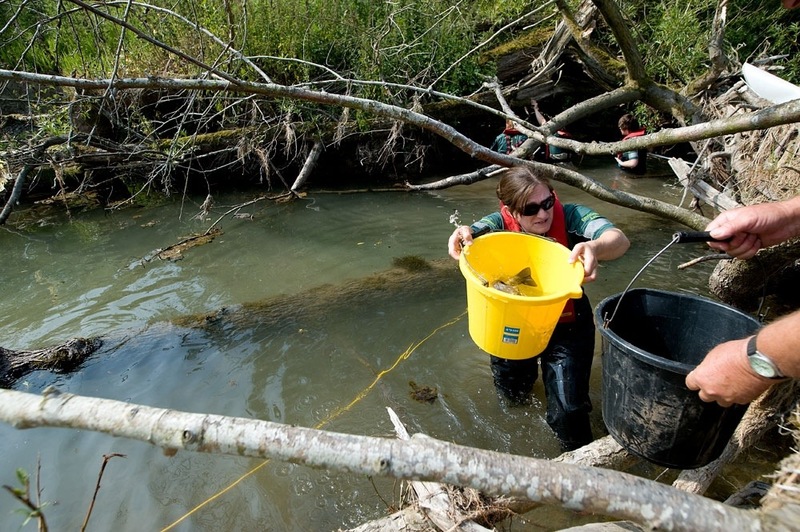 It’s taken the wettest year on record. Even water levels in the aquifers, which take much longer to respond to rainfall, have now recovered (see chart below). Indeed, in some parts of the country (such as Dorset) groundwater levels are so high that they are causing flooding problems of their own. Who would have guessed that in April? So have we had a vision of the future during 2012 or just been subjected to the natural variability of the British weather? I don’t know, and I’d suggest neither does anyone else. It’s not possible to attribute any single event to climate change. However, if we do accept that the world is warming, then the typeof weather we’ve seen during 2012 (and indeed in the years before) are more likely to occur. Warmer air holds more water and changes to ocean temperatures may change the global scale air circulations (such as the jet stream) which have a huge impact on our weather. 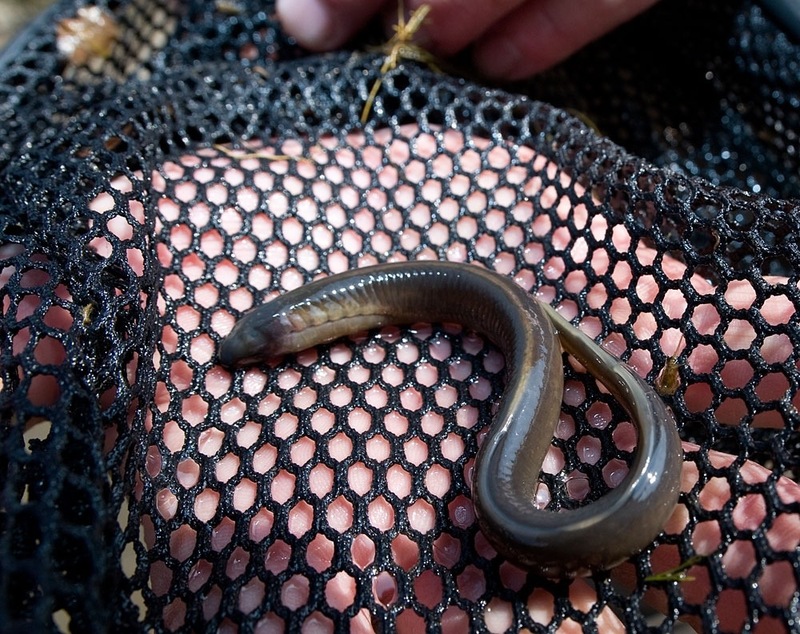 Extremes (of all sorts) are more likely. Whether you believe in climate change or not, we’re encouraging everyone to think about extreme weather and how we can be better prepared. 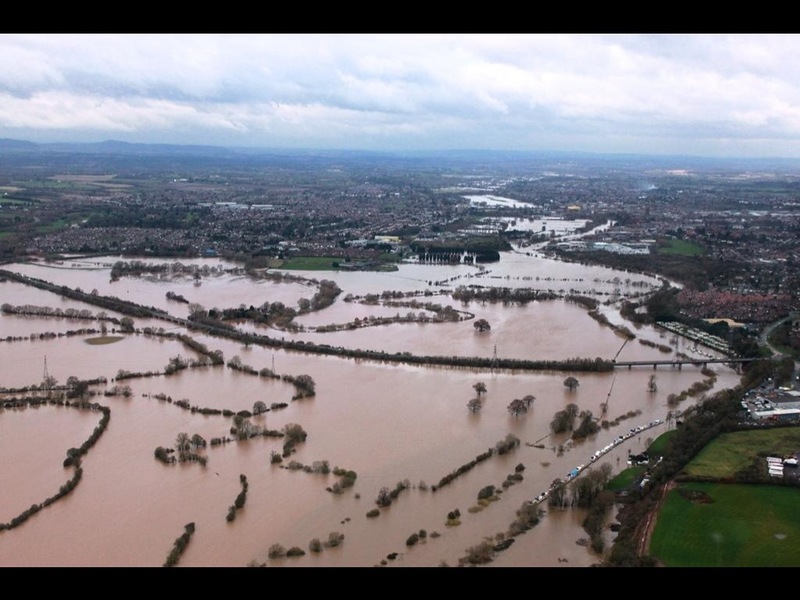 Over the last decade tens of thousands of people across the Midlands have been affected by extreme weather events. Surely a bit of thought about your levels of risk and how it may affect you, your family or your business in future makes sense!